Does it matter? Dust can make your Mac Pro run hotter. Accumulated dust on the fans themselves can affect their speed and efficiency. One source claims "dust bunnies" can cause electrical shorting, leading to an early end of life for components. If there is any condensation, the dust can be morph into conductive sludge. (Gag.) If you have carpeting or pets that shed, the problem can be even worse. 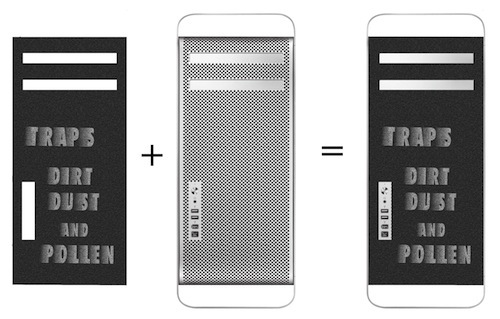 Trans International has a solution: a precisely cut foam dust filter that clings to the front panel of your Mac Pro. They call it 'iSchmutz." 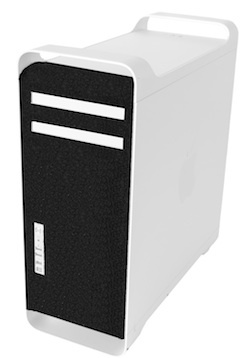 It has openings for the Mac Pro's optical bays, USB/FireWire ports, and power button. Being mad scientists, we asked ourselves, "Does the filter slow the air flow enough to alter fan speeds and/or temperatures inside the Mac Pro?" With the "iSchmutz" filter attached, we ran a CPU cruncher, Geekbench's constant Stress Test. Using Hardware Monitor, we recorded fan speeds (Intake, Exhaust, CPU Booster, Expansion Bay, and Power Supply). We also recorded temperatures (CPU Cores, memory modules, and Northbridge chip). After multiple runs with, without, with, without the filter, there were no significant changes between with and without. For a PCIe Expansion bay test, we ran Heaven Benchmark which stresses the graphic card, heating up the bay. There were no significant changes between with and without. Before adding the iSchmutz, it's a good idea to clean the pre-existing dust out of your Mac Pro. HOW DO YOU CLEAN DUST OUT OF YOUR MAC PRO? There are many articles online suggesting the procedure. Let me share some of the highlights. Take the Mac Pro into an open space, open the side panel, and blow it out with a compressed air canister. It might be helpful to remove components such as the optical bay assembly, the hard drive sleds, any PCIe cards installed. No need to remove the memory but it might be helpful to remove the processor card or processor tray. Do NOT use a vacuum or feather duster or 'Swiffer' inside the Mac Pro. Those cleaning tools can generate static charges that can damage electrical components. When you spray the compressed air can, don't spray too long or frost will form on components. When you feel it getting cold, stop and switch to a second can while the first one warms up. You should wear a mask so you don't breath in the dust. (I feel a sneeze coming just thinking about the cloud of dust.) Maybe goggles are a good idea, too. Wearing latex gloves can help attenuate static charge. If you have a static discharge strap for your wrist, that would be useful -- though it needs to be long enough not to restrict your movement. A small, soft anti-static cleaning brush can help on some stubborn places like a heat sink or memory card or fan grills. Because the heavier debris reacts to gravity, work top to bottom Use a vacuum to pick up larger dust particles that accumulate around the cleaning area. But again, do NOT use the vacuum to clean the inside. Order direct from Trans International. USA readers can help us earn a commission by using this Apple Store USA link or by clicking on any Apple display ad. For GPUs, click the left side bar option for "For Mac > Displays & Graphics" to find the GPU kits available. Or if you are buying a new Mac Pro, you will find options when you configure your order. For UK readers, visit Apple Store UK.